I picked up the 3 day City Card and I was not disappointed. So many locations / activities / public transit are included with the card. This is a definite must if you want to save some money and have a great time. The tour I took was a lot of fun and the guide seemed to be pretty well informed. At one point the tour seemed to get a little repetitive but overall it was quite enjoyable. 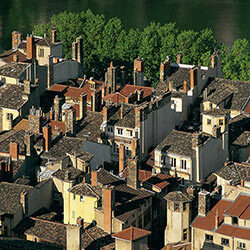 Take a historical tour of Medieval and Renaissance Lyon. 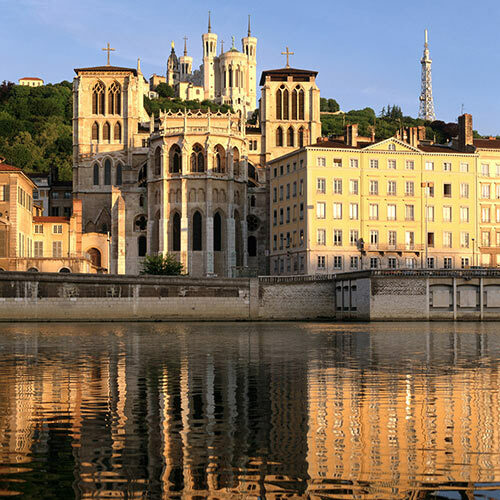 From the church of Saint Paul to that of Saint Georges, Vieux-Lyon extends over 24 hectares along the banks of the Saône. Along the way you'll encounter essential monuments such as La Maison du Chamarier, the Hôtel de Gadagne or La Loge du Change. Explore the remains of the churches of Sainte Croix and Saint Etienne backing onto Saint Jean, which is truly symbolic of the power of the church in Lyon at that time. Your guide will tell you the secrets and anecdotes which have made the reputation of this historical district, the 1st preserved sector in France to have been inscribed on UNESCO's World Heritage List. You're bound to notice the very particular atmosphere. We suggest a meal in one of the traditional bouchon restaurants after the tour (an experience not to be missed). Please ensure you arrive 10 minutes before the tour commences. Audio guided tour: we ask that you kindly bring your personal head/earphones. A pair will be supplied to those who do not have any. Among the many treasures to be found in Saint Jean cathedral is the 14th century astronomical clock, which boasts the oldest wrought iron mechanism in France. It is 9.35 m high and 2.20 m wide, so you can't miss it! 30 anthusiastic guides : an unprecedented offer indeed! My Franco-Welsh origins include Paris and Brittany, yet it is in London, where I aimed to find an English spouse, that I met my husband who is from Lyon, who taught me to love his city. Having been absorbed into an old family at the origin of very famous stores: 2 passages / Printemps, Grand Bazar / Monoprix, I also married into their history, as well as the family's wine growing estate in the part of Beaujolais that produces the crus. I have a passion for the history of art, so after bringing up our children, I embarked on a Master's degree. I love passing on my knowledge, telling stories and having a good laugh. Depending on the season, I am either a teacher of the history of art to the Compagnons du Tour de France*, a painter, or of course, your guide. (*French organization of craftsmen and artisans dating from the Middle Ages). I'm used to guiding top-of-the-range customers and foreign journalists, and love taking people on all the usual tours, the Fine Arts museum, the murals and especially the hills in the lovely Beaujolais region, with their scenery, their châteaux and the wine growing estates from the inside. I'm very much open to the international scene, and here with you today because all my 6 grandchildren live abroad. I'm Delphine, one of the twenty or so lecturing guides that work for the Guides' Bureau. Our service is incredibly rich: we all have our own profiles, our own interests, our own areas of study and our own favourite type of public. What I love is the variety of its districts and their architecture, the wealth and diversity of its history and the Men who built it, the beauty of its monuments, particularly the light reflected from the façades that border the Saône early in the morning or at the end of the day; it's a trip in itself! Paa gensyn, bis bald, see you soon, à bientôt ! All I need is a sturdy pair of shoes and a good hat, and I'm ready to take you on a "voyage through our city" I'll be delighted to take you on a discovery tour of our "landmark" sights as well as my own favourites. In other words, I'd like to help you gain insight into the soul of our city! And on the way, I'll tell you all about the history and art of our UNESCO-listed capital. 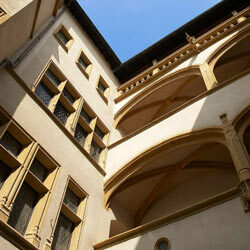 I was born at Hôtel-Dieu, one of the most magnificent historical monuments in Lyon. I hope I have not become blasé, and have retained the eyes of a child to help you discover life in our city. During tours, people often ask me if I'm a student. I'm too old for that. I'm a historian without the qualifications. I'm an architect without the diploma. But I was born in Lyon, and I enjoy helping members of the public discover this city which is a lot more than just a row of lovely façades. You have to get a feel for the substance of the past, the depth of roots, the art of construction, the relation with light, the appeal of good food, one's relationship with a site, and the diversity of the different areas. What you see counts of course, but as far as I'm concerned, a tour is only successful when people have had a good time, when I've managed, throughout the tour, to take them behind the scenes, to give them a sense of how people lived in those days and how we live in the city today. I'm often delighted to hear people say they want to come back and spend more time here. I started out by working as a lecturing guide for a travel agency for 7 years. Then I decided to settle permanently and resumed my initial job as a guide in my hometown. I have a passion for History, and the Middle Ages and the Renaissance in particular, and the history of art, and therefore particularly enjoy being in this city which boasts several centuries of history. I love good food, and really blossom in this capital of gastronomy, where good food is part of local culture. So I quite naturally took an interest in the history of food and chefs. So many passions I intend to share with you during your next visit. Hello, I've been a lecturing guide for the Tourist Information Office for many years. Although I should have retired a long time ago, I'm lucky to still be able to share my passion for Lyon with visitors. After studying the History of Art and Archaeology at university and spending two years in Rome to perfect my Italian, I joined what was then the Tourist Information Office, seeing the city change over the years. Lyon has been my city of adoption for several decades now, so as a polyglot with a lovely Austrian accent to boot and a passion for Lyon, I'm here to take you on a discovery tour of the city and its surrounding areas. I'll be delighted to guide you through this great city, from Roman times to the 21st century! "Look and listen to the stones of my city". Teaching people to look, telling stories, making sense of things, that's mainly what motivates me in my job. My own personal story has mainly unfolded in Lyon, which I have proudly seen blossom over the past decades. Sharing with visitors from all over the world -I speak English and German- the beauty of my city is a great pleasure to me, and an honour. But what I also like is talking to the locals themselves, while helping them understand the specific characteristics of their area. Lyon adopted me 34 years ago and I love it! Studying languages and the history of art as well as having a passion for history determined my career as a lecturing guide. Although I moved to Lyon by chance, I must admit I love this city and feel happy here! I love Lyon for its past and present that combine and merge in the melting pot of history, and are also apparent in its incredible vitality that many city's envy! I adore the uniqueness of Lyon… its glorious Roman past which archaeologists never tire of revisiting, as well as Vieux-Lyon, its Renaissance area (second only to Venice) and its secret and mysterious traboules. My love for Lyon also resides in my love of food, as this world capital of gastronomy boasts a record of one restaurant for 294 people! I love Lyon for its culture, its biennials and its museums which are the stuff dreams are made of! So many reasons that explain why I'm so very attached to Lyon and wouldn't leave it for an empire..., as far as I'm concerned, it's ONLY LYON! How lucky I am to have been able to study the history of art and archaeology in Lyon. It's magic! From the Roman theatres to the Musée des Confluences, past, present and future combine in beauty and harmony, just like the gold, silver and silk threads woven by the canuts. Let your eyes feast on the golden light that's worthy of Italy, and gilds the slopes of Croix-Rousse on summer evenings as you stroll along the embankment amid the seagulls and boats. I love this city because life is so sweet here, and I love telling visitors all about it, as the enthusiastic urbanist in me sees the city as a living organism. I was born in the north of France and decided to come to Lyon about fifteen years ago to finish my studies… and I've been here ever since! Having starting out in Bourgogne, I now work as a guide in Lyon and the surrounding area (Vienne, Beaujolais, southern Bourgogne, Pérouges). What I still really enjoy about this job are the human encounters and the wide variety of themes broached. It's never boring! My favourite place in Lyon: Les Jardins du Rosaire… an absolute must! I've always lived in Lyon, and I love it. I particularly like going up onto Croix-Rousse hill, where I lived for many years, to look out over the city. What a view! You never tire of admiring the constantly changing panorama of the city, and the view that extends all the way to the Alps. This area has lost nothing of its authenticity. Follow me! Let's "débarouler" down the slope and stairs in the footsteps of the "canuts", the weavers who secured Lyon's fortune during the 19th century. In Lyon, there's plenty of History of course, and plenty of stories to be told, but there's also Gastronomy and the "bouchons"... A whole past and art de vivre à la Lyonnaise that I'll be delighted to help you discover and enjoy. Bringing together the past and present, and knowing that the future is always built on what came before: maybe these are the reasons I decided to become a tour guide… Who knows! Adopted by the city of Lyon, over time I have become an adequate Lyonnais and I would even venture to say that I am now as passionate about this city as any local! I spent my childhood between Corsica and Tarare, just to the west of Lyon, which goes to show that anything is possible! I then studied tourism in Nice and Paris and began a career in the travel industry. Later, returning to my roots to settle down was the natural choice for me. I've always lived in Lyon and have always loved my city. So after studying tourism and the history of art, I joined the tourist information office to share my passion. As far as I'm concerned, accompanying a group is first and foremost about sharing friendly moments devoted to discovering the wealth of our heritage. I'm particularly fond of taking young people on a discovery tour of Lyon and seeing the city through their eyes! I'm passionate about architecture and I love visiting museums in France or abroad. A lovely exhibition is always a great excuse to travel! My passions? Creative leisure activities: scrapbooking, embroidery, crochet… I like to keep my fingers busy! See you soon in the streets of Lyon! The decision to change my choice of studies to the History of Art at university, then to attend the School of Art and Communication was an obvious choice. Having always lived between Rhône and Saône, I love travelling the length and breadth of Lyon. With each new viewpoint, I add new touches to my internal painting of its landscape. In a city that lies at the crossroads of so many different influences, I never tire of going from one area to another, experiencing the change of century, architecture and atmosphere. Discovering Lyon, is also about meeting the locals, past and present, that have marked the city, and to whom we owe our heritage, our particular characteristics, our "lyonnitude". My tours invite you to view the city like a tightrope walker balancing between light-heartedness and knowledge, gastronomy and architecture, silk and alchemy, football and botany, cinema and historic periods... And many other subjects that are the essence of Lyon. Although I'm interested in the world in general, I chose to return to the city where I grew up, not to work but to pursue a passion: guiding visitors through Lyon, my home town. I will take you on a trip through time, from past to future, in a city where you can never be bored, and where there's something of interest for every generation. . So if you want to discover the different areas in Lyon like a real little "gone" (street urchin), don't hesitate to follow me! I've worn out many pairs of trainers in the traboules and on the slopes of the three hills, I'm acquainted with Guignol's entire repertoire, and know where you can enjoy the best mâchons. If you're interested, I'll be waiting under the horse's tail! I have a passion for history and architecture, and I'm always delighted and in high spirits when it comes to leading groups through the streets of Lyon, which is my playground. I'm naturally very curious, something I refuse to see as a fault. I even think it's my best quality, a necessary tool to my trade. Outside tours, there's every chance you'll find me walking with my nose in the air, looking at the surrounding façades and monuments (wow… have you seen the doors in Rue Victor Hugo?!). Or within close proximity of Fourvière Basilica, a young damsel all decked in white that I love, and am always delighted to share with visitors. Or you may see me sitting nibbling a patisserie at the terrace of a tea shop; this is the capital of gastronomy, after all. As an inhabitant of Lyon by adoption, I left my dear native soil of the Dauphiné 4 years ago, because of my love for the capital of the Gauls. And Lyon is so much more than that, if only you knew! Originally from the countryside surrounding Lyon, I went travelling around the world before returning to Lyon, which many French people rate as the most beautiful city in France, except for their home town of course! As a child, I always associated Lyon with the zoo in Tête d’Or Park, with its bear, elephants, lions and other animals. Later on, as an apprentice archaeologist in Fourvière, I discovered the city’s history and heritage. I hope to share my passion for art and history with you during your stay and take you back through time as you discover the birth of this great city in the traboules (hidden passageways) of Vieux-Lyon (Old Lyon), imagine the sounds of the silk looms on the slopes of Croix-Rousse hill (where the silk industry once thrived), and learn about Lyon through its painted walls in the city centre. In short, I want to share my love for the city! From Fourvière Basilica to the museums in the Presqu’île district, I know how to get children interested in history and heritage, without forgetting the parents of course! My tours are lively and dynamic, so you can feel the heartbeat of my city and feel at home. Far away from Lyon, my specialism at university was Egyptology, and my second passion is Japan: once you get me started on these subjects it’s difficult to stop me! Lyon is my “home port” following years spent outside of France and a long stay in Germany. I’m originally from a region neighbouring Lyon, a city I wasn’t familiar with at the time, having chosen to study art history in Paris. For me, Lyon is all about the brilliant blue skies in the summer and the splendid façades of neighbourhoods that have been left intact by history, as well as the tradition and joie de vivre of its traditional local eateries known as ‘bouchons’, its famous puppet Guignol and its markets. I love strolling through this inspiring city, with its hills and rivers, which is never very far from nature and always at the heart of culture. I look forward to showing you Lyon and helping you fall in love with the city! When seeking to share Lyon's heritage with people, I like to broach the question from the viewpoint of technical skills and know-how, and even economy, whether it's architecture and town planning, or vineyards and gastronomy. Located at a geographical crossroads, the city of Lyon has always warmly welcomed people of various origins, whether it’s for a drink, a meal, a stay or to live, as it did for me. As a tour guide, I get to meet people from various regions, countries and cultural backgrounds every day. This is why I decided to study foreign languages (English and German). Originally from Picardy, I settled in Lyon after tasting life in the laid-back Loire and bustling Paris. In the end, I had the greatest affinity with Lyon. Like Lyon, I love food: the Capital of Gastronomy is a mouthwatering place to be! Like Lyon, I have the gift of the gab: this city has more than 2000 years of history and anecdotes to tell. Like Lyon, I am curious: you need to explore behind the city’s façades and through its traboules to really get to know it. Lastly, like Lyon, I like a laugh: the city’s famous puppet Guignol and its cafés-théâtres are a delight! Come with me to discover what you share with Lyon! 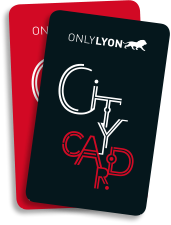 you need for your next stay in Lyon.